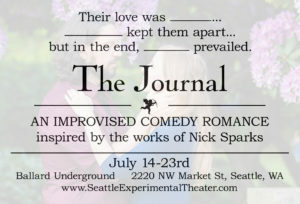 This is OPENING WEEKEND for the return of The Journal, a romantic improvised comedy inspired by the work of Nicholas Sparks. Continues Thursdays, Fridays and Saturdays through July 23 (8PM) at the Ballard Underground. Tickets $18 online or $20 at the door. Daryl Ducharme is one of the three returning members of the cast of The Journal (2016). His SET debut was with the cast of “Wedding Horror Stories” in 2013. Along with Wayne (who shared his perspective in yesterday’s blog) we asked Daryl if he’d be willing to share his thoughts on returning to The Journal; here is his reply in his own words. Tonight is opening night of The Journal and I am nervous. I’m not nervous in an “Oh, my god I can’t go out there” sort of way but rather in an “I love this show so much, I hope the audience shares the love with me” way. What’s there to love about The Journal? Please, allow me to let you in on my love of it. First, there is the nostalgia. In 2012, when The Journal first came out, I had never been a part of an improv show before. This was the first time I had ever been cast in a show. I remember being nervous about playing with a cast that already worked so well together and that I thought were clearly better than I. By the end of the run, however, I learned how easy it is to play with them all and that run still has one of my favorite improv memories. Another big reason I love this show is that I am a romantic at heart. While I do love a good big budget summer blockbuster, my favorite movie is a romance by Baz Luhrman called Strictly Ballroom. Before that my favorite movie was The Cutting Edge starring DB Sweeney and Moira Kelly. These romances are vastly different than Nicholas Sparks romances, which I actually find quite hard to watch. Sure, I might cry at a Sparks flick but life has the silliness of a good romantic comedy. That is exactly why I love making fun of the “taking ourselves too seriously” tropes of Nicholas Sparks while still getting to see a good romance blossom. The Journal consistently melts my heart. I’m sure it will melt yours. Finally, I love this show because of the people. SET is great people and the people they cast are of a certain breed. They make me laugh. They make me cry. They get me excited to improvise a whole new romance at every rehearsal. I hope that the audience will enjoy The Journal as much as I do and that they leave with more love in their hearts. That’s the way I’ve been leaving rehearsals and I believe the performances will only be better. Intrigued? 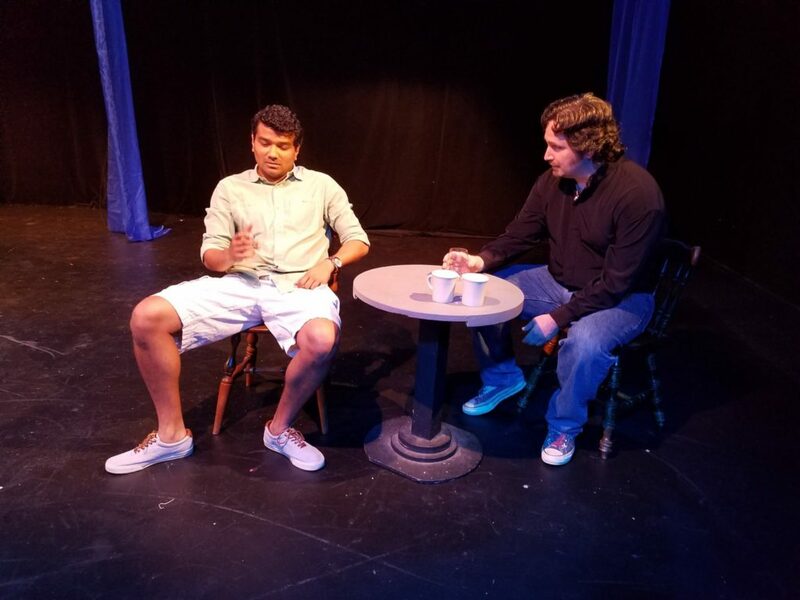 The Journal opened on July 14 and gave the audience a dramatic romance between a juggler and a woman who had a dark secret: cheating at Pokemon Go. We continue tonight through July 23 at the Ballard Underground in Seattle. Thursdays, Fridays, and Saturdays at 8PM. Tickets available for $18 ($14 for groups of 4 or more) online at http://thejournal.bpt.me OR for $20 each at the door. This entry was posted in Behind The Scenes, The Journal and tagged improv. Bookmark the permalink.